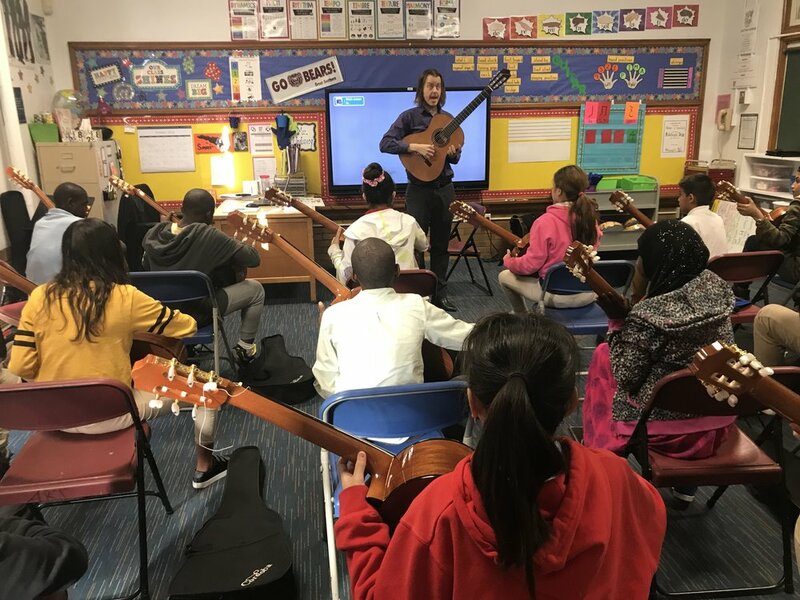 Nahed Chapman New American Academy (NCNAA) is home to one of our strongest Guitar Horizons education programs. Part of St. Louis Public Schools, the school serves as a preparatory program for refugee students to transition from their home countries to the United States. Middle school students spend up to two years at NCNAA before enrolling at their zoned middle or high school. During those two years, students learn English as a second language, adjust to life in US public schools, and now can learn guitar! On Tuesday, October 9, the guitar class at Chapman Academy performed their first concert. After 9 weeks of instruction, the sixteen played three pieces under the steady direction of Mark Akin. The performance was in tune, with steady tempo and greeted with rousing applause by the student body which filled the auditorium. We spoke with two of the participants, both in seventh grade: a young lady named Noor, from Iraq, and a young man Hilal, from Afghanistan. Noor has been in the US for just a year and a half. She learned English only upon arrival, primarily from a friend she made, but her comprehension was remarkable. Having had no prior music experience, she told me that "at first I was worried," but that "after the first week I was no longer nervous." She found Meditation the most difficult to learn, as people next to her were playing sounds different from her part. Her favorite piece was Floating in the Cosmos, saying "it makes me feel happy." And after the performance she felt “excited."